Whistler is the perfect place to celebrate love and friendhip, with an intimate alpine village surrounded by snowy mountains and evergreen forests. 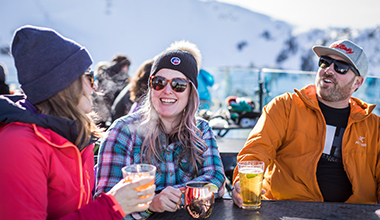 Whether you are ready to propose, wanting to share time with a new friend, or are seeking a soulmate-worthy adventure, time out in Whistler is just what your relationship needs. See all Whistler Winter Activities to browse more options. Need help planning the perfect weekend? Let a Whistler based travel consultant assist you to plan a Valentine's Day to remember with the latest information on activities, cozy accommodation and more. Call 1.800.944.7853. Here's what's happening on Valentine's Day and into the weekend. View our complete Events Calendar for all events happening in Whistler. Check out our locals’ date ideas, proposal tips and stories of finding true love in the mountains. Perfect your Valentine's Day experience with the culinary delights on offer from our exceptional village restaurants.